In April 2018 Philip Pulley, who hasn’t had a rental license since 2015, sent the roughly 100 residents of Admiral and Dorsett Courts eviction letters stating they had to leave within three weeks. The Philadelphia Tenants Union and the tenants of the two buildings joined forces to organize a rally for the day of the illegal eviction. An injunction won by Community Legal Services stalled the eviction, but ultimately couldn’t stop Pulley from selling the buildings and kicking everyone out. 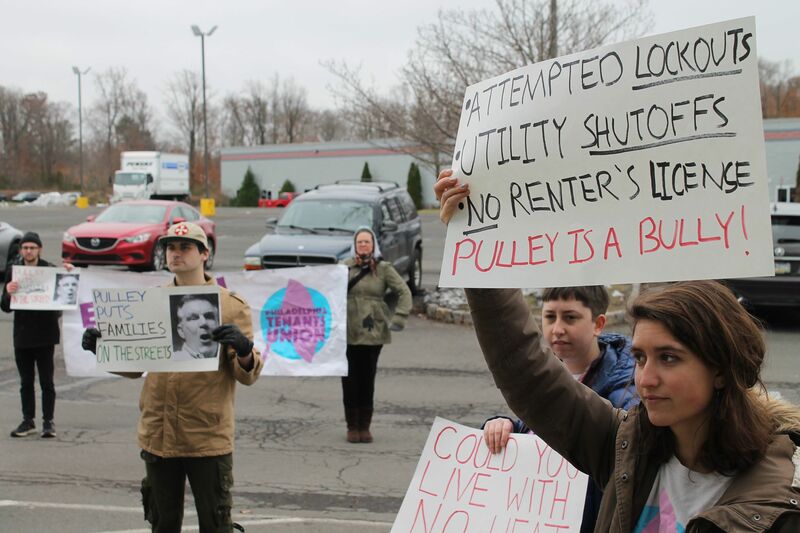 To bring attention to the way Philip Pulley has treated tenants throughout this mass eviction, the Tenants Union organized a rally at an ice skating rink he owns in Warminster, PA. On the morning of November 24th, about 15 people gathered outside the entrance to Revolution Ice Gardens, where he hosted a Thanksgiving fundraiser, with flyers, signs and a megaphone to let people attending the event know to whom they were giving their money. Another woman attending Pulley’s fundraiser yelled at the protesters that there was no point in them being there, that they should let the law settle the issue and stop bothering the children and their families just trying to have nice day. Before a police officer approached her and got her to stop shouting, one of the protesters snapped back saying that the reason they were out there was precisely because the law wasn’t doing its job. As is typically the case involving disputes between between tenants and landlords, the law did everything in its power to protect Pulley and SBG. On November 30th all the remaining tenants of Admiral and Dorsett Courts—some of whom have lived there for up 20 years—were forced out of their homes by Pulley and his property management company, SBG.